THE DISCOVERY OF THE GENESIS LEGENDS. Cosmogony of Berosus.—Discovery of Cuneiform Inscriptions.—Historical texts.—Babylonian origin of Assyrian literature.—Mythological tablets.—Discovery of Deluge texts.—Izdubar, his exploits.—Mutilated condition of tablets.—Lecture on Deluge tablets. "—Daily Telegraph" offer.—Expedition to Assyria.—-Fragments of Creation tablets.—Solar Myth.—Second journey to Assyria.—Tower of Babel.—Clay records.—Account of creation in "Telegraph. "—"Daily Telegraph" collection.—Interest of Creation legends.—The Fall.—New fragments.—List of texts. that these traditions were in Babylonia before the Jewish captivity, and could not afford testimony in favour of the great antiquity of these legends. time occupied almost exclusively the attention of students, and overshadowed any work in other divisions of Assyrian literature. collection, which I had previously selected under the head of "Mythological tablets," to find, if possible, some of these legends. This mythological collection was one of six divisions into which I had parted the Museum collection of cuneiform inscriptions for convenience of working. By placing all the tablets and fragments of the same class together, I had been able to complete several texts, to easily find any subject required, and at any time to get a general idea of the contents of the collection. The mythological division contained all tablets relating to the mythology, and all the legends in which the gods took a leading part, together with prayers and similar subjects. whose name appeared to be Izdubar. I recollected a legend belonging to the same hero Izdubar K. 231, which, on comparison, proved to belong to the same series, and then I commenced a search for any missing portions of the tablets. could not be arranged in order from want of indication of the particular tablets to which they belonged. Some other fragmentary legends, including the war of the gods and three fables, I also found at the same time, but these were in such mutilated condition that I could not make a connected translation of them. In my lecture on the Deluge tablets, I gave a sketch of the Izdubar legends, and expressed my belief that the Chaldean inscriptions contained various other similar stories bearing upon the Book of Genesis, which would prove of the highest interest. new fragment of the Chaldean account of the Deluge belonging to the first column of the tablet, relating the command to build and fill the ark, and nearly filling up the most considerable blank in the story. Some other fragments, which I found afterwards, still further completed this tablet, which was already the most perfect one in the Izdubar series. The trench in which I found the fragment in question must have passed very near the place where the Assyrians kept a series of inscriptions belonging to the early history of the world. Soon after I discovered the fragment of the Deluge tablet, I came upon a fragment of the sixth tablet of the same series in this trench, and not far from the place of the Deluge fragment. This fragment described the destruction of the bull of Ishtar by Izdubar and Heabani, an incident often depicted on early Babylonian gems. My next discovery here was a fragment evidently belonging to the creation of the world; this was the upper corner of a tablet, and gave a fragmentary account of the creation of animals. Further on in this trench I discovered two other portions of this legend, one giving the Creation and fall of man; the other having part of the war between the gods and evil spirits. At that time I did not recognize the importance of these fragments, excepting the one with the account of the creation of animals, and, as I had immediately afterwards to return to England, I made no further discoveries in this direction. On my return from the east, I published some of the discoveries I had made, and I now found, on joining the fragments of the Deluge or Izdubar series, that they formed exactly twelve tablets. The fact that these legends covered twelve tablets led to the impression that they were a form of the solar myth, that is, that they symbolized the passage of the sun through the heavens, each tablet representing a separate sign of the zodiac. This opinion, first started by Sir Henry Rawlinson, was at once accepted by M. Lenormant, Rev. A. H. Sayce, and other scholars; but I think myself it rests on too insecure a basis to be true. In a subsequent chapter I will give as nearly as I can the contents of the Izdubar legends, which I think do not warrant this view. Some months further passed, during which I was engaged in my second journey to Assyria, and in realizing the results of that expedition. I again brought from Assyria several fragments of the Genesis legends which helped to complete these curious stories, and in January, 1875, I commenced once more a regular search for these fragments. Very soon afterwards I succeeded in discovering a notice of the building of the tower of Babel, which at once attracted attention, and a notice of it, which appeared in the "Athenæum," No. 2468, was copied into several of the papers. I was, however, at that time hardly prepared to publish these legends, as I had not ascertained how far they could be completed from our present collections. Subsequent search did not show that any further fragments of the Babel tablet were in the British Museum, but I soon added several fresh portions to the fragmentary history of the Creation and Fall. The greatest difficulty with which I had to contend in all these researches was the extremely mutilated and deficient condition in which the tablets were found. There can be no doubt that, if the inscriptions were perfect, they would present very little difficulty to the translator. The reason why these legends are in so many fragments, and the different parts so scattered, may be explained from the nature of the material of which the tablets are composed, and the changes undergone by them since they were written. These tablets were composed of fine clay and were inscribed with cuneiform characters while in a soft state; they were then baked in a furnace until hard, and afterwards transferred to the library. These texts appear to have been broken up when Nineveh was destroyed, and many of them were cracked and scorched by the heat at the burning of the palace. Subsequently the ruins were turned over in search of treasure, and the tablets still further broken; and then, to complete their ruin, the rain, every spring soaking through the ground, saturates them with water containing chemicals, and these chemicals form crystals in every available crack. The growth of the crystals further splits the tablets, some of them being literally shivered. Some idea of the mutilated condition of the Assyrian tablets, and of the work of restoring a single text, will be gained from the engraving below, which exhibits the present appearance of one of the Deluge tablets. In this tablet there are sixteen fragments. 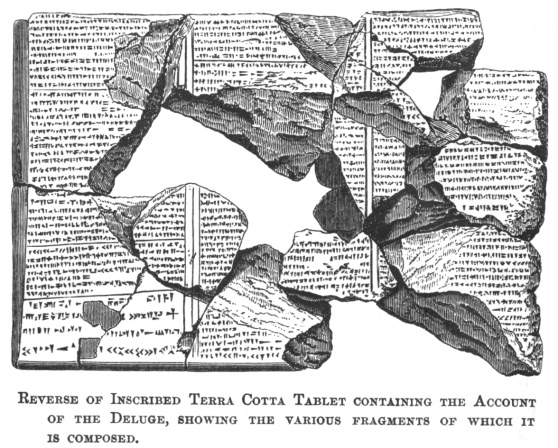 REVERSE OF INSCRIBED TERRA COTTA TABLET CONTAINING THE ACCOUNT OF THE DELUGE, SHOWING THE VARIOUS FRAGMENTS OF WHICH IT IS COMPOSED. my two journeys, and yet there remain at least 20,000 fragments buried in the ruins without the recovery of which it is impossible to complete these valuable Assyrian inscriptions. "Having recently made a series of important discoveries relating to the Book of Genesis, among some remarkable texts, which form part of the collection presented to the British Museum by the proprietors of 'The Daily Telegraph,' I venture once more to bring Assyrian subjects before your readers. "In my lecture on the Chaldean Account of the Deluge, which I delivered on Dec. 3, 1872, I stated my conviction that all the earlier narratives of Genesis would receive new light from the inscriptions so long buried in the Chaldean and Assyrian mounds; but I little thought at that time that I was so near to finding most of them. pieces in the old Museum collection, and all join or form parts of a continuous series of legends, giving the history of the world from the Creation down to some period after the Fall of Man. Linked with these, I found also other series of legends on primitive history, including the story of the building of the Tower of Babel and of the Confusion of Tongues. 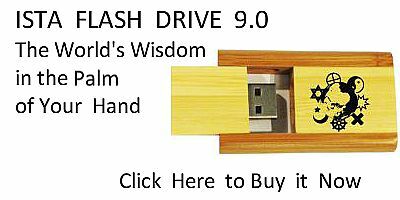 "The first series, which I may call 'The Story of the Creation and Fall,' when complete must have consisted of nine or ten tablets at least, and the history upon it is much longer and fuller than the corresponding account in the Book of Genesis. With respect to these Genesis narratives a furious strife has existed for many years; every word has been scanned by eager scholars, and every possible meaning which the various passages could bear has been suggested; while the age and authenticity of the narratives have been discussed on all sides. In particular, it may be said that the account of the fall of man, the heritage of all Christian countries, has been the centre of this controversy, for it is one of the pivots on which the Christian religion turns. The world-wide importance of these subjects will therefore give the newly discovered inscriptions, and especially the one relating to the Fall, an unparalleled value, and I am glad, indeed, that such a treasure should have resulted from your expedition. from which the earlier part of the Book of Genesis was copied, it is evident that the brief narration given in the Pentateuch omits a number of incidents and explanations—for instance, as to the origin of evil, the fall of the angels, the wickedness of the serpent, &c. Such points as these are included in the Cuneiform narrative; but of course I can say little about them until I prepare full translations of the legends. "The narrative on the Assyrian tablets commences with a description of the period before the world was created, when there existed a chaos or confusion. The desolate and empty state of the universe and the generation by chaos of monsters are vividly given. The chaos is presided over by a female power named Tisalat and Tiamat, corresponding to the Thalatth of Berosus; but, as it proceeds, the Assyrian account agrees rather with the Bible than with the short account from Berosus. We are told, in the inscriptions, of the fall of the celestial being who appears to correspond to Satan. In his ambition he raises his hand against the sanctuary of the God of heaven, and the description of him is really magnificent. He is represented riding in a chariot through celestial space, surrounded by the storms, with the lightning playing before him, and wielding a thunderbolt as a weapon. [paragraph continues] Mosaic narrative, surveying each step of the work and pronouncing it good. The divine work culminates in the creation of man, who is made upright and free from evil, and endowed by the gods with the noble faculty of speech. "The Deity then delivers a long address to the newly created being, instructing him in all his duties and privileges, and pointing out the glory of his state. But this condition of blessing does not last long before man, yielding to temptation, falls; and the Deity then pronounces upon him a terrible curse, invoking on his head all the evils which have since afflicted humanity. These last details are, as I have before stated, upon the fragment which I excavated during my first journey to Assyria, and the discovery of this single relic in my opinion increases many times over the value of 'The Daily Telegraph' collection. "I have at present recovered no more of the story, and am not yet in a position to give the full translations and details; but I hope during the spring to find time to search over the collection of smaller fragments of tablets, and to light upon any smaller parts of the legends which may have escaped me. There will arise, besides, a number of important questions as to the date and origin of the legends, their comparison with the Biblical narrative, and as to how far they may supplement the Mosaic account." legends presented to me soon after I discovered them. On comparing this account with the translations and notes I have given in this book, it will be evident that my first notice was inaccurate in several points, both as to the order and translation of the legends; but I had not expected it to be otherwise, for there had not been time to collect and translate the fragments, and, until that was done, no satisfactory account of them could be given, the inaccuracies in the account being due to the broken state of the tablets and my recent knowledge of them. It is a notable fact that the discovery of these legends was one of the fruits of the expedition organized by the proprietors of the "Daily Telegraph," and these legends and the Deluge fragments form the most valuable results of that expedition. After I had published this notice in the "Daily Telegraph" I set to work to look over the fragments in the collection, in search of other minor fragments, and found several, but these added little to my knowledge, only enabling me to correct my notice. A little later I discovered a new fragment of the tenth tablet of the Deluge series, and last of all a further portion of the sixth tablet of these legends. This closed my discoveries so far as the fragments of the tablets were concerned, and I had then to copy and translate the tablets as far as their mutilated condition would allow. 1. A long account of the origin of the world, the creation of the animals and man, the fall of man from a sinless state, and a conflict between the gods and the powers of evil. 2. A second account of the creation having a closer correspondence with the account of Berosus. 3. A Bilingual legend of the history of the seven evil spirits, apparently part of a third version of the creation. 4. Story of the descent of the goddess Ishtar or Venus into Hades, and her return. 5. Legend of the sin of the God Zu, who insults Elu, the father of the gods. 6. Collection of five tablets giving the exploits of Lubara the god of the pestilence. 7. Legend of the god Sarturda, who turned into a bird. 8. Story of the wise man who put forth a riddle to the gods. 9. Legend of the good man Atarpi, and the wickedness of the world. 10. Legend of the tower of Babel, and dispersion. 11. Story of the Eagle and Etana. 12. Story of the ox and the horse. 13. Story of the fox. 15. Izdubar legends: twelve tablets, with the history of Izdubar, and an account of the flood. 16. Various fragments of other legends. These show that there was a considerable collection of such primitive stories almost unrepresented in our present collection.